The big question before the freedom-hungry crowd was: are things really better now than they were then? ‘Then’ meaning the day – May 3rd 27 years ago on 1991 – when African journalists met in Namibia under UNESCO’s umbrella and produced the Windhoek Declaration? It marked the moment when African journalists threw off their symbolic chains, born out of apartheid, colonial oppression and autocratic or military governments, and demanded the “holy trinity” of press freedom – media freedom, independence and plurality. 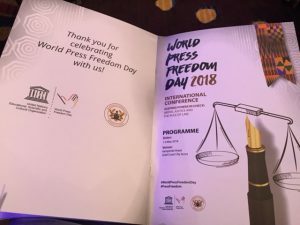 It took just two years from that moment for the nations of the UN in 1993 to declare May 3 the annual World Press Freedom Day – a date to commemorate the hardship of many, and inevitably the death of some of the champions of press freedom; and to take stock of how best to strengthen the defenses against the enemies of free speech. 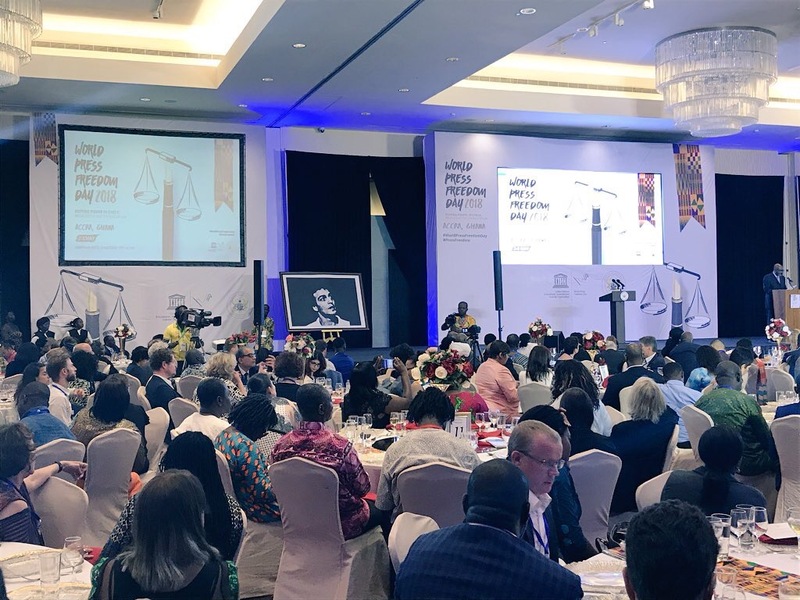 This year Africa was again the host — in Accra, Ghana, which as its political leaders declared often this week, is widely seen as the best example in all of Africa of press freedom and democracy in action. The main theme was: ‘Keeping Power in Check: Media, Justice and the Rule of Law’. So what about the answer to the question: is Africa, and is the world itself, in a better or worse state with regard to press freedom now compared than then? Gwen Lister, who took part in the 1991 Windhoek meeting and was jailed for her struggle for media freedom and independence, spoke in Accra. Her verdict: ‘We have gone one step forwards but two steps back’. In brief, the laws are better; Ghana and Namibia now have a vigorous and plural media. But many journalists in Africa still suffer terribly for their work — 73 were killed between 2012 and 2017); and political forces have grown more aggressive in finding ways to dominate the news or take over the media themselves, while the information ocean on social media risks drowning us in doubtful information. A senior Nigerian media figure, Edetaen Ojo, described the general situation for media on the African continent as ‘dire’. An African woman journalist raised the case of last August’s Kenyan elections, where the government used censorship to stifle widespread protests and a member of the Election Commission was killed in horrific circumstances, leading the Supreme Court to annul the election result in favor of the incumbent president. Against that, famously oppressive governments in Zimbabwe and Gambia have been replaced in the past year by more reform-minded ones. All is not lost. The key to understanding the under-current of doubt and fear at the gathering in Accra is in the title of this year’s event: ‘Keeping power in check’. Too often, politicians confuse their personal advantage with the public interest and that spells trouble for the rule of law and press freedom. A member of the Human Rights Network for Journalists declared that the rule of law is being trampled in Somalia, Uganda and Liberia because too often the elected politicians actually tell their security forces to kidnap and kill journalists. Even in Ghana, much lauded for being rated top country in Africa for press freedom, the Media Foundation for West Africa has just published figures showing that the country also tops the list of violent attacks on journalists in the region in the past 16 months, with 45 recorded assaults in that time. More insidiously, several African speakers lamented the ‘brown envelope’ syndrome by which journalists are persuaded to attend press briefings and write favorably about powerful figures in return for bribes. One of them was quoted as saying that journalists are paid such a pittance that they are forced to accept the dirty money just to buy their weekend groceries. Penury breeds dependency and corruption, in other words. Ghana’s president, Nana Addo Dankwa Akufo-Addo, publicly said that he accepted the need for liberal laws, even though they meant he could be ‘vilified’ by critical media in his country. He was proud of having repealed Ghana’s laws on criminal libel. But he also declared that unethical reporting in the media risked having ‘catastrophic effects on the society and on public trust. Critics say he has dragged his feet for too long without living up to a long-standing promise to enact a freedom of information law. Going back to that nagging question: are things better or worse? On the plus side, fewer dictatorships, higher standards of living and the ongoing Internet revolution have raised public expectations about accountable government and the right to free speech. Yet paradoxically, UNESCO’s figures on journalists killed because of their work keeps rising steadily, to over 800 in the past ten years. And the number of journalists in jail around the world has reached a record high of over 260, according to the Committee to Protect Journalists. In Accra the acclaimed Egyptian photo-journalist Mahmoud Abou Zeid, known as ‘Shawkan’, became a symbol of today’s life or death struggle for press freedom and human rights, as he was declared the winner of UNESCO’s 2018 World Press Freedom Prize. He has been wrongly held in jail for over four years just for taking news photos at a public demonstration, and prosecutors have reportedly called for him to be sentenced to death. Speakers here called on the Egyptian government to spare his life and free him. Press freedom and the rule of law cannot be separated, just as the work of politicians and journalists are inexorably linked. For me the most promising words uttered at this year’s Press Freedom gathering were these from Lillian Tibatemwa-Ekirikubinza, a Justice in the Supreme Court of Uganda. 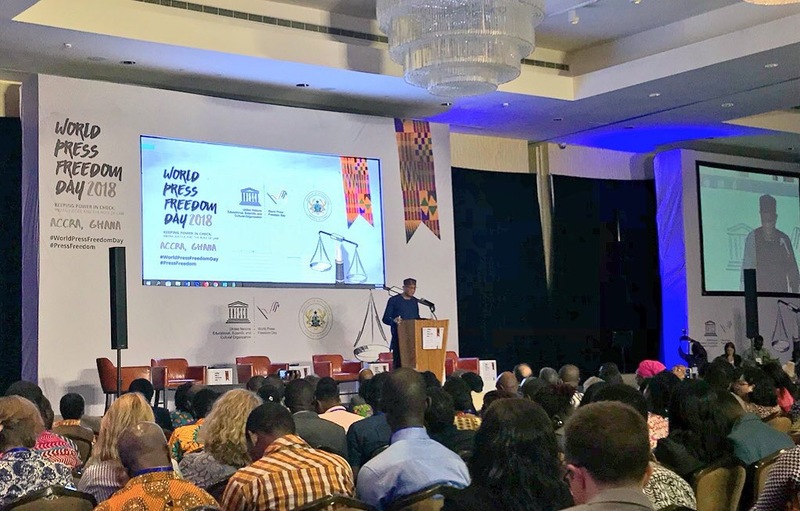 Speaking on the role of the judiciary in enhancing freedom of expression in Africa, she said it was the duty of judges in courts at all levels across Africa to apply ‘best practice’ by making progressive decisions on the freedom of expression cases that come before them. Those words are a definition of ‘accountability’, which is at the heart of the concept of the rule of law and of the UN’s Sustainable Development Goals, with their forward-looking focus on access to justice, fundamental rights and information. In that sense nothing much has changed since the Windhoek Declaration. The world still needs free, independent and plural media to hold power to account. The alternative is untruth and injustice.